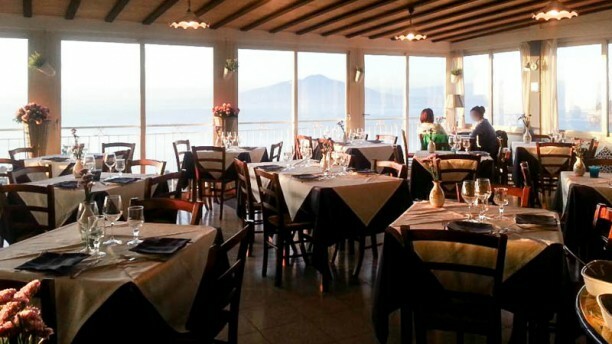 WITH VIEW - A few kilometers from the center of Sorrento, near Naples, is the Ristorante Il Borgo. A warm and very friendly atmosphere, where the staff offer an accurate service, attentive and always on time. The property also has a beautiful terrace where you can dine while enjoying a breathtaking panoramic view . The local menu features specialties, classic Sorrento and Campane, prepared using only the highest quality ingredients, fresh and genuine. It does not miss also a very good pizza, baked in a wood oven and prepared according to the original Neapolitan recipe. TO DRINK - To wash it all down, there are excellent local wines. Exceptional experience. Incredible views. Fantastic food. Really enjoyed our meal. A beautiful setting and friendly staff. Another fabulous dinner at Il Borgo !!! Recommend to all great setting and great food with taxi service built into cost! The sunset view is mesmerising and then the food came out and we thought we had died and gone to heaven. We had four courses to truly experience the menu and every dish was made to perfection. Definitely worth a visit. This was the restaurant with the best sight seeing we visited. The food was good but we had to wait for a long time while the restaurant was half full. I think it is a bit touristic but it's definitely worth it for the view. Wonderful location with a great atmosphere. However the waiting staff were not attentive and we were not offered dessert and due to waiting we decided to ask for the bill (at least twice). It was a pleasant dining experience and we loved the view, but do not expect an attentive service. Antonio was very accommodating on our arrival and had spoken before in regards tother shuttle service they offer. Food was good, reasonable priced. Also they made some dessert as a nice gesture for my girlfriends birthday. The views are awesome too. Dear Andy thank you for the wonderful review is always a pleasure to please our customers, if you can make one even on TripAdivisor I'm grateful. Thanks again for your visit I hope to see you soon at the "Borgo"
Nice touches and excellent taste. Awesome Hõme made pasta, excellent service and spectacular view-going back again tomorrow!!!! Beautiful views. Good food, Shuttle service provided, by the restaurant which is a plus. The view from this restaurant is simply breaktaking. The owner is incredibly proud of his restaurant (and rightly so) and very helpful. The food was fabulous and reasonably priced. Staff were also very efficient. We were a table of two, and often you are rushed when you are two, but not here. We were in for the evening and felt very relaxed throughout the meal. So good, we are going back! They also offer a free shuttle bus from the town up to the restaurant which is very convenient. A highlight of our trip to Sorento. Friendly and welcoming, the atmosphere was typical genuine Italian rustic style . Lovely food and fantastic views. What an amazing restaurant - simply stunning views and glorious food. The staff could not do enough to make our visit special.